When Rob Dyrdek and MTV launched Ridiculousness last year, fans of comical shows constructed out of crazy web clips might have noticed that it was an extremely shameless ripoff of Comedy Central’s Tosh.0, but it didn’t matter much: Tosh.0 is consistently one of the cable channel’s highest-rated shows, and Ridiculousness is never mentioned or watched by you or anyone you know. 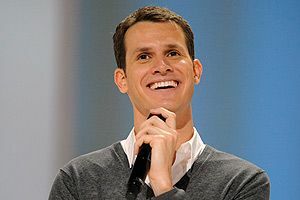 Daniel Tosh has made the odd joke about the striking similarities between his show and Dyrdek’s, but none have been as direct as in the latest episode on Tuesday, in which a Web Redemption for a skateboarder hit by a truck winds up in a facility very similar to the titular setting of a previous Dyrdek show, Fantasy Factory. Though Dyrdek’s name is never uttered, Tosh dresses in Dyrdek’s signature style while presiding over a platoon of shirtless preteen boys and plying them with booze and foam machines. ‪#liveandlearn‬.” Beef called on account of good sense! Instead, let’s turn our attention to the ongoing battle between Stephen Baldwin and Kevin Costner.